It usually isn't hard to find mundane fungi and mushroom subjects for mushroom photography (just snap some pictures of the dry rot eating away at the wood in your basement), but it isn't always easy to find fungi subjects 'worthy' of fine art mushroom photography or to capture wild mushroom photographs which will provide the enhanced digital images from which wild mushroom art prints can be printed. While mushroom mycology means that one may well find several kinds of unwanted fungi growing in a dank corner of the basement, fortunately the fungi kingdom is diverse and fungi grow in many more aesthetically appealing and enriching environments suitable for mushroom photography, not only in the forest, but in grasslands (e.g. 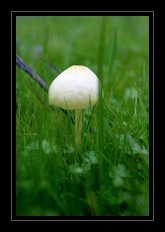 field mushrooms) and many other more rich and colorful locations as well. In order to find the raw materials from which to build the master mushroom photograph for a C Ribet wild mushrooms art print, both luck and art must come together to provide the mycological micro-environment around the mushrooms which will give the mushroom photograph the character to grow from a mere mushroom photograph through a mushroom photograph master and eventually to a final wild mushroom art print. Creating wild mushroom art prints from wild mushrooms are a special kind of mycological adventure. 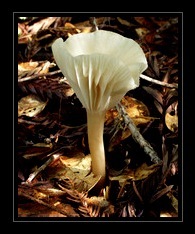 Finding the wild mushrooms for the prints is just the first step in the mushroom photography process. Luckily the mycological world of mushrooms and the fungi kingdom is broad and there is no shortage of fine subjects for wild mushroom art prints.